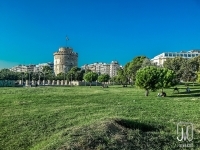 Thessaloniki is the capital of Macedonia and one of the oldest cities in Europe. General Kassandros named it after his wife, who happened to be Alexander the Great's half-sister. With its wide avenues, parks and squares, some travellers consider it far more attractive than Athens. The city's past under Ottoman rule shows in numerous Byzantine churches, and museums housing Byzantine artefacts. Its rich Jewish tradition reflects in its synagogues and the Jewish Museum, while renowned monasteries display the influence of early Christian communities. Authorities have imposed regulations against skyscrapers going up as the area is prone to earthquakes. This means that residents and visitors can enjoy seaside views from the city's streets. Visitors can try the Turkish Baths, wander the central market, or relax at Aristotelous Square's cafes and restaurants. Thessaloniki also has a vibrant nightlife, with a number of lively bars and clubs. We are looking for contributors for our Thessaloniki travel guide. If you are a local, a regular traveller to Thessaloniki or a travel professional with time to contribute and answer occasional forum questions, please contact us.